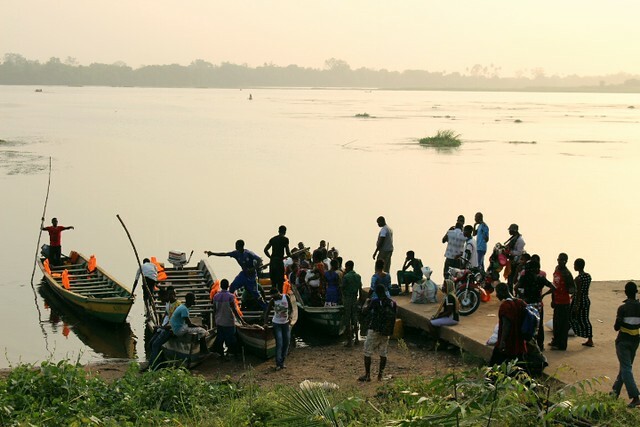 On an early evening at the year’s end, the atmosphere along the banks of the Volta River in Adidome is abuzz as flocks of festival goers gather in close proximity to the docks. The procession of chiefs and district representatives have touched down, marking the 6th day of the annual Mafi Hogbetsotso Za Festival. Even as the day’s ceremonies near its close, young and old continue to arrive on bicycles and on foot. Excitedly, we all take in the views of the revelry from every angle possible. Distinct sound waves resonate over the landscape – the invocations, the talking drums and singing – interjected by the occasional celebratory firing of rifles. 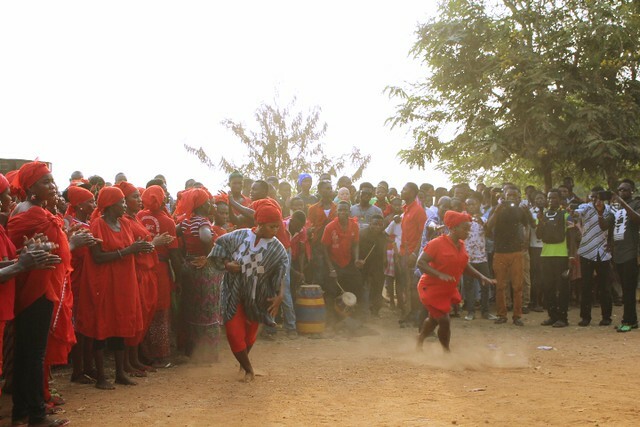 Several meters from the riverbank, dust kicked up from dancing feet and smoke from firecrackers, rises as men and women perform the agbadza. Some onlookers record each move on a mobile device, others heartily cheer them on. This evening commemorates the Mafi people’s communal migration towards liberation. 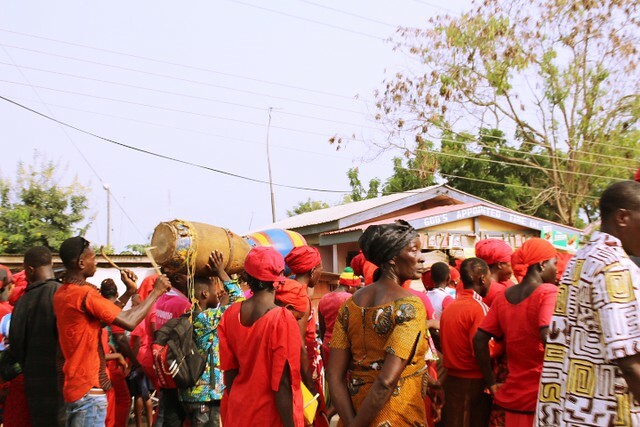 Each December in the second week, the festival chronicles the plight of the Mafis forefathers’ journey to Ghana from present-day Togo. Their escape from oppressive rule under King Agorkorli led to their consequential settlement along the banks of the Volta River. For generations, the Mafis have made this place in the Central Tongu District home. They’ve settled in some of the most fertile parts of the region—the latest figures show that 78% of Central Tongu District residents are involved in the agricultural sector. For Hogbetsotso, people arrive at the town of Adidome, the heartland of the Mafi people and the Central Tongu district, to perform customary rites. Here, people flow freely between public and private spaces, congregating in the compounds of specific elders and in designated parks and streets. Ingrained in the festival are themes of peace, unity and community development. 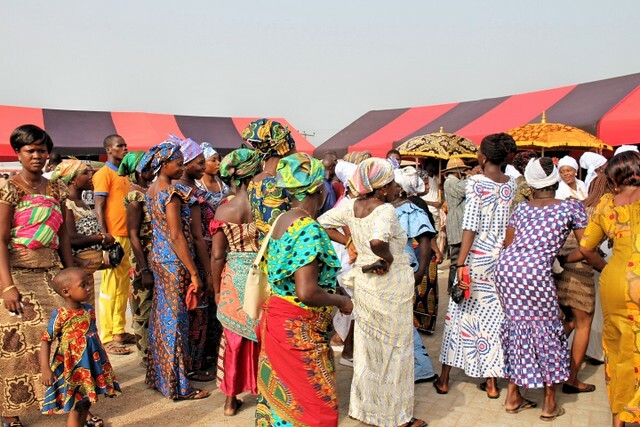 Like a reenactment of the exodus from Togo, the festival occurs over the course of seven days. 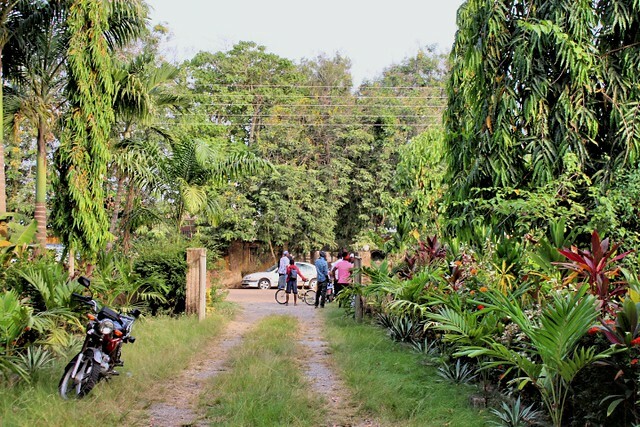 The main points of interest include a street candlelight procession, back-to-back community clean-up days organized by each district, bicycle races and the Miss Hogbetsotso pageant. These rituals energize the place. At the start of the day, the procession meets for dancing, pomp and pageantry in Lorry Park, the center of Adidiome’s market and a small-scale commercial district, as participants and spectators gather then continue on through the main street. On most days, whether in urban or rural areas in Ghana, cars – not people – hold precedence on streets. But during Hogbetsotso, the streets automatically turn into corridors for throngs of walking feet. Cars and trucks park and watch or turn the opposite direction to find an alternative route to arrive at their destination. Several hundred meters away, another community elder allows young residents to turn a section of his concrete campus into a stage and seating area for a large audience. They work quickly – trying to keep in time with their proposed schedule – setting up DJ equipment and speakers for a late night fashion and talent show – salsa dancing included. A unique aspect of these festivities grounds the experience, connecting it to attendees’ daily realities. On Saturday at the grand durbar, community members voice their needs via petitions for increased development for their towns and villages. Charles Fiagbenu, a young resident from Adidome, describes how on this day town residents turn jubilation into mobilization around issues they’re concerned with. “At the grand durbar, they do appeals for funds,” he explains. These funds can be used towards development projects that have historically included water, roads and sanitation issues. Chiefs and other residents give what they can, but the main requests are directed at the Central government and conveyed to the government ministers in attendance. The festival concludes at the feet of the Volta River. A small brigade of navigators bring their canoes and begin loading up with passengers headed to the other side of the River after spending the day in the Adidome marketplace. People around the streets lean up against motorbikes and bicycles to catch the last scenes and soon, crowds gradually thin out. What remains of the festival is the spirit it conjures up: connectedness borne from community gathering and mobilization. Every rite and service performed during Mafi Hogbetsotso Za is an opportunity for civic engagement. On the one hand, the Festival is an acknowledgment of the importance of cultural resilience, and on the other, it is a platform for the voicing of communities’ development needs and concerns. As a first-timer, I’m left reflecting on where the community has been and where it might be headed. Interesting festival & great post! Do you know how long the festival has been taking place and when the practice of making financial pleas to the Central government began? I’m also curious about how, if at all, that practice (of making pleas) fits into other structures for receiving funding from the central government.